Robin Rhode, Wheel of Steel, 2006, Digital pigment prints mounted on board, nine parts, edition of five, Courtesy the Artist. Curators’ Series #8, All Of Us Have A Sense Of Rhythm, DRAF (David Roberts Art Foundation), 5 June – 1 August 2015. Published in the July 2015 Digital Edition of Art Africa. Christine Eyene is the eighth guest curator in DRAF’s Curators’ Series. The exhibition – “All Of Us Have A Sense Of Rhythm” – explores iterations of sound and music, dance and movement. Works selected encompass found sound, music, poetry, performance, the moving image and sculpture. Eyene draws attention to modernisms as experienced through black subjectivities fashioned out of the political, cultural and intellectual resistance to racial violence – in many forms, overt and less so. 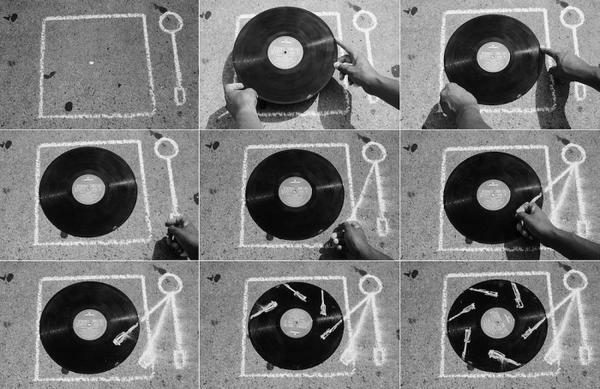 Eyene’s research brings together writings, sounds and images that speak to multiple, and even unexpected, historical points of connection, between musical structures and rhythms, movement and objects. She locates these in relation to the specificities of the African continent, and its encounter with Europe and America, foregrounding particular histories, notably Négritude. Her juxtaposition of John Cage, Syvilla Fort and Langston Hughes is especially powerful as an archival gesture making visible the narratives and creative dialogues that have been erased and forgotten. All Of Us Have A Sense Of Rhythm asserts multiple historical and geographical nodes of inquiry of which the contemporary is a significant aspect. Em’Kal Eyongakpa and William Titley present works purely about the experience of listening. Eyongakpa’s works VIII-03 (study) and XXIV-04 (in a bubble)  are compelling in their articulation of the connectedness of sound and place. The sounds evoke associations with marketplaces, sites of trade and social life; reminiscent of familiar rhythms and repetitions I associate with urban life on the African continent. In making Northern Souls: The Sound of an Underground (2014), Titley installed microphones beneath the dance floor of a Northern Soul all-nighter. The electric experience of dance and the Northern Soul phenomenon, which appropriated black soul music, and flourished in 1970s working class Britain, is displaced. Instead we hear the hidden sonic life beneath the floor, creaks and echoes. Zak Ové’s sculptures suggest a counterpoint to these works and their exploration of the ephemeral materiality of pure sound. He deploys the now defunct objects and devices through which sound once was transmitted. Ové’s The Upsetters (King and Queen) is a monumental sculptural pairing constructed from vintage stereos, turntables, speakers, mics and black and white Jesmonite masks. But here sound, and its relationship to the figures of power suggested, can only be imagined through its absence. Eyene’s curatorial essay must be read, and indeed, should have a life beyond that of the exhibition itself. I especially enjoyed the personal narrative with which the essay begins as it situates Eyene both as a curator and an intellectual. This is a project drawn out of in-depth historical research in dialogue with lived knowledge. Eyene narrates a memory of childhood as part of the African diaspora: “as children from the Cameroonian community […] knowing how to dance Bikutsi was a way to claim our cultural identity”. She relates an anecdote about Langston Hughes – apparently he became a poet as a child through the imposition, while at school, of the assumption that “all black people had a sense of rhythm.” This familiar instance of racial stereotyping is mobilised, and then deconstructed, through work that offers up ambiguity, critical humour and rich and unexpected poetic juxtapositions. Larry Achiampong’s vinyl record Meh Mogya samples sounds from Ghanaian Highlife, and a speech by Kwame Nkrumah, producing a scratchy syncopation. Julien Bayle’s Uncommon Circles (Parts 1-3), is a triptych staging a radical, and unpredictable, experiment with real-time pattern generation and audio-reactive visual generation paradigms. One of the strengths of the exhibition is its refusal of a singular subjectivity and method of working. Connections can be drawn between works, but these, like processes of rhythmic and musical syncopation, suggest many possible routes. 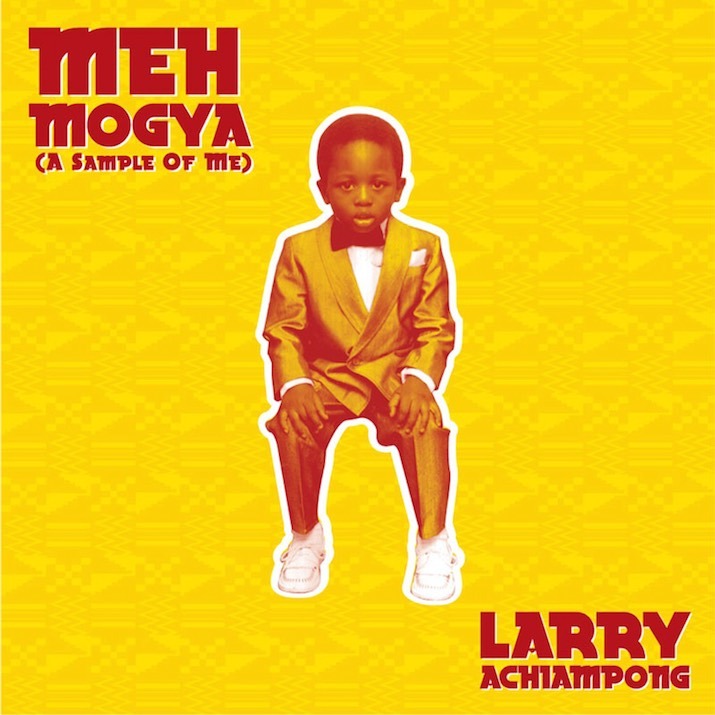 Larry Achiampong, Meh Mogya (A Sample of Me), Digital Album, Courtesy the Artist. This entry was posted in Review and tagged Abstraction, Christine Eyene, Curating, Dance, David Roberts Art Foundation, Diaspora, Larry Achiampong, Modernism, Movement, Music, Négritude, Sound, The Idea of Africa. Bookmark the permalink.